The site of the potentially worst nuclear power station accident before Chernobyl. 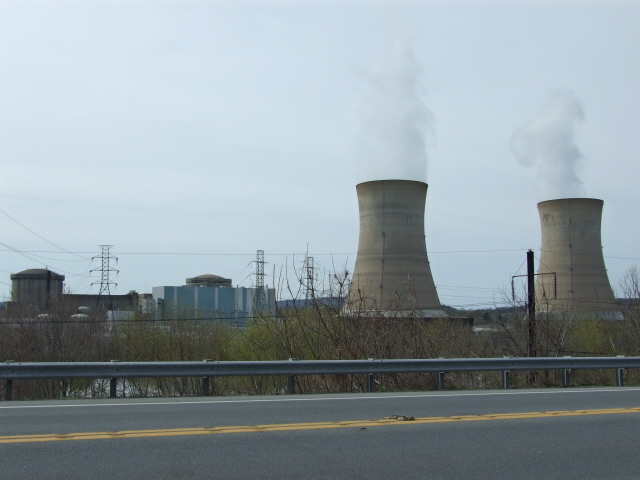 The accident happened in 1979 at a power plant called Three Mile Island but it is better known under the name of the closest city, Harrisburg, which is in central Pennsylvania, USA. 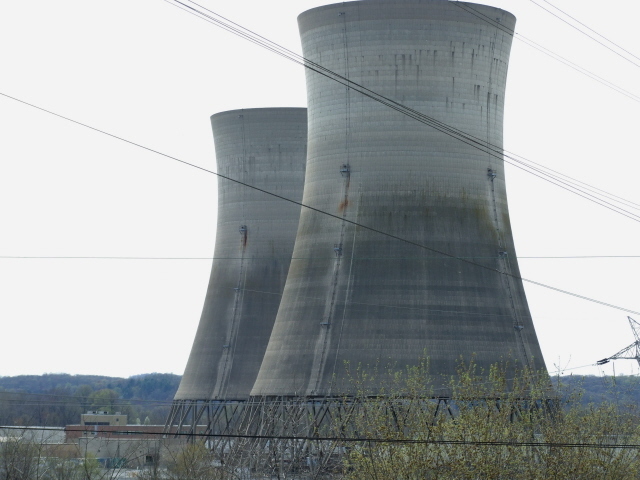 More background info: Unlike at Chernobyl in 1986, there were no casualties in the Harrisburg accident, but the chain of events at Harrisburg's Three Mile Island (TMI) plant (which takes its name from the fact that it's on an island in the river three miles south from the Middletown district of Harrisburg) got perilously close to a catastrophe that could have been on a similar scale – only in a much more densely populated area. The incident still stands as the worst civilian nuclear accident ever in the USA. Without going too much into the physics of it all, this is roughly what happened in March/early April 1979: pump failure and operation errors led to a breakdown of the cooling system which in turn led to an accumulation first of steam (instead of cooling water) and then of hydrogen in the upper parts of the reactor core. Thus exposed it came to a partial reactor core meltdown. In any case, the area around the plant was partly evacuated – as the spectre of a real nuclear catastrophe loomed large in the north-east of the USA. At the plant, the hydrogen bubble was released, including, controversially, venting straight into the atmosphere, to regain control of the reactor core. Finally, it could be cooled and the situation was more or less defused. The damaged core obviously meant the plant was lost and continued to pose serious risks. Thus, over many subsequent years, the radioactive material of the plant had to be disposed of. During the clean-up operations, which lasted until 1993, further smaller accidents occurred. For a while the parallel plant TMI-1 (the reactor where the accident happened was the newer TMI-2) remained switched off as well. But it was later re-commissioned and is still in use today. Recently, it even had its licence renewed. 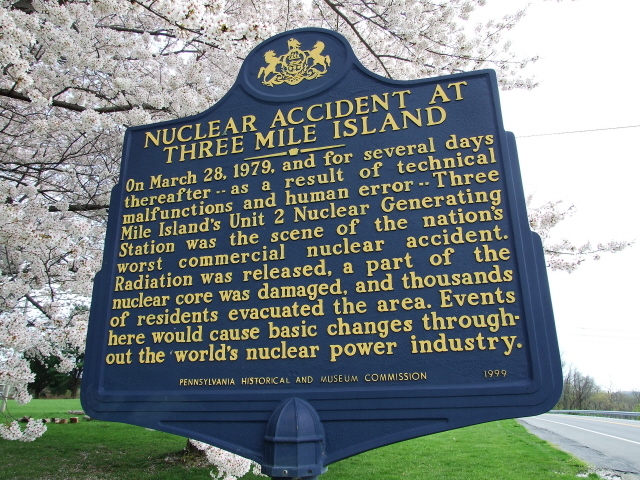 Even though the actual damage done was nowhere near as bad as it could have been, the legacy of Harrisburg's TMI accident remains one of the best-known – partly also because of the movie "The China Syndrome" about a fictional nuclear reactor accident that had been released only days before the real accident at TMI and thus received a huge boost at the box office while at the same time heightening the public's awareness of the risks of nuclear energy. The name "China Syndrome", incidentally, is sometimes attributed to the exaggerated idea that a complete meltdown of a reactor core could allow the white-hot "lava" to bore its way through the Earth's core to come out at the other end of the globe (even though that wouldn't be China, from a US perspective). While that is obviously not actually physically possible, the scenario of an uncontrolled radioactive lava mass burning itself into the ground, while releasing huge amounts of radiation and potentially hitting groundwater level(!) is scary enough. Of course, the industry tried to play down the event at TMI (as usual) – but only seven years later the far worse accident at Chernobyl in Ukraine confirmed what a dangerous business nuclear energy can really be (its complete core meltdown very nearly caused a real "China Syndrome"). Both accidents eventually led to tightened safety measures in nuclear power plants worldwide (to varying degrees, of course), but no one can in principle guarantee absolute safety. Whatever safety net is in place, there will necessarily always be the element human error involved in the risk. And what can happen when the safety regime does fail is still at the heart of the arguments of those who oppose nuclear energy. The accident at the Harrisburg TMI plant certainly gave a lasting boost to the anti-nukes movement. In fact, the building of new nuclear plants also markedly dipped after the accident (and further still after Chernobyl). These days, this form of allegedly clean energy generation is being promoted by some as a "green" alternative to fossil-fuel-based power plants. One can only hope that the awareness of the risk of nuclear accidents like at TMI will not suffer in this discussion … not to mention the completely unsolved problem of nuclear waste disposal (though see NTS). What there is to see: The site as such is not developed at all for curious (dark) tourists, so there's thus nothing much to see. You certainly can't just wander onto the plant's premises and snap pictures. As is often the case at such sites – cf. Dounreay – even getting close to the fence or gate wielding a camera could prompt the security guards into more action than you'd want. So the best you can do is have a quick look from the road when driving past … but you may want to stop briefly at what used to be the plant's visitor centre (now a staff training centre) where there is a historical marker (dated 1999) that very briefly outlines the significance of the spot. Location: the Three Mile Island plant is ca. 12 miles (19 km) south-east of Harrisburg, PA, in the Susquehanna River, along which PA Route 441 runs, ca. 4 miles (6 km) from Harrisburg airport. Harrisburg itself is located in south central Pennsylvania, roughly 100 miles (160 km) north-west of Philadelphia. Access and costs: no access to the site itself, which can only be viewed from the road along the river; and this is of course free. Details: to get closest to the site you have to take PA Route 441, which runs south of Harrisburg International Airport at Middletown along the river towards Marietta and Columbia, PA.
From Harrisburg airport first take Route 230 eastbound then turn right into Ann Street and immediately left again (still Ann Street), which connects to Route 441 at a bridge over a creek, after which the road is called Canal Street. Continue on this road for approximately 2 miles (3 km) and you will pass the northern access street and gate to the Three Mile Island plant. Don't stop here, though, but continue further south. Either go all the way past the length of the island that lies parallel to the road in the river, past the south access road/bridge to the plant, and then turn round to go back up – or stop straight away at the former visitor centre, ca. three quarters of a mile south of the main plant entrance you passed earlier. 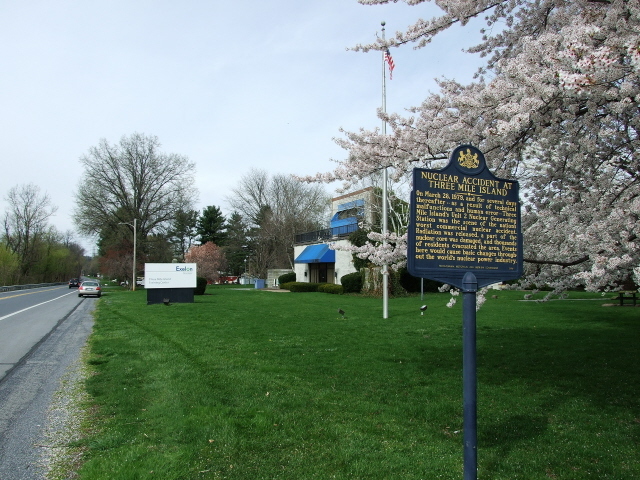 This is now the "Exelon Nuclear Three Mile Island Training Center", marked by a big white sign in front of a building that stands out thanks to its blue roof over the front entrance. The historical marker stands by the road just 20 yards or so to the south. Time required: just a few moments for a look from the distance and maybe a few seconds to read the historical marker. Getting there will take up much more time, even if you live in the area. Combinations with other dark destinations: The city of Philadelphia is an easy drive of ca. 100 miles (160 km) away and thus makes for a perfect combination, or a base from where to make the trip out to Three Mile Island. Washington D.C. isn't much further to the south, so it could be an equally good alternative. And just over 50 miles or so (circa 80 km) to the north-east of Harrisburg is Centralia, PA. Combinations with non-dark destinations: nothing much nearby – Harrisburg itself is not the most interesting city in the US, but Philadelphia, New York and Washington D.C. are all not too far away for a much better alternative. In general see under USA.